The health care industry is constantly evolving and providing consulting services to health care entities can be challenging. PPC's Guide to Health Care Consulting provides the technical guidance and practical advice you need to successfully serve your health care clients. 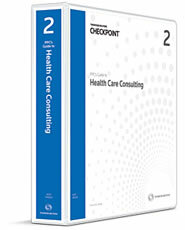 The Guide has been designed for use by CPA practitioners, health care industry finance directors, consultants, or others who are considering health care consulting. The Guide's practice aids and illustrative examples (such as example contracts, example cost reports, checklists, questionnaires, and financial statements) can be used immediately in your practice. The guidance and practice aids also are excellent tools for training staff who work for health care consultants or health care providers.